Item # 317020 Stash Points: 2,995 (?) This is the number of points you get in The Zumiez Stash for purchasing this item. Stash points are redeemable for exclusive rewards only available to Zumiez Stash members. To redeem your points check out the rewards catalog on thestash.zumiez.com. Upgrade your headwear style this spring with the Hankley black and rainbow bucket hat from Vans. This mostly black fishing-inspired hat is highlighted by a rainbow striped band above the brim. Constructed with a shallow fit and soft brim, this hat can easily be added into all your daily swag. 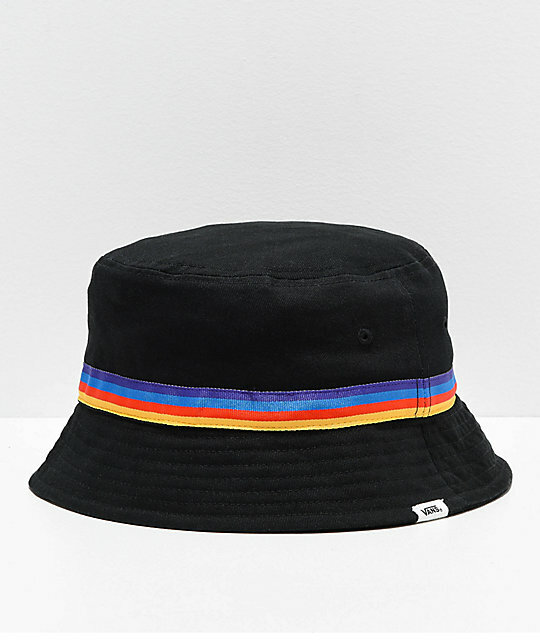 Hankley Black and Rainbow Bucket Hat from Vans. Black hat with rainbow band. 22" (56cm) around on a size S/M.